I grew up in New England. I know, I know…Greenwich, CT is on the edge of New York but still, it îs New England. I’m never, ever late for anything. You won’t find me on your doorstep without first calling you, and I refer to those big, long a submarine or hoagie sandwiches as a “grinder” which is very Connecticut. I spent summer holidays eating oysters and clams raw, sans the cocktail sauce, picked fresh that morning by my dad, straight from the bay in Wellfleet, MA. The first home I ever purchased was in Norwalk, CT, famous for mussels. I also make a wicked, creamy fish chowder. I love mussels. They are beautiful as the subject of a painting and they are even better to eat. I only eat them steamed. But once, at the Grand Bazaar in Istanbul, I had some unbelievably tasty mussels on a stick, swathed in a creamy garlic sauce. 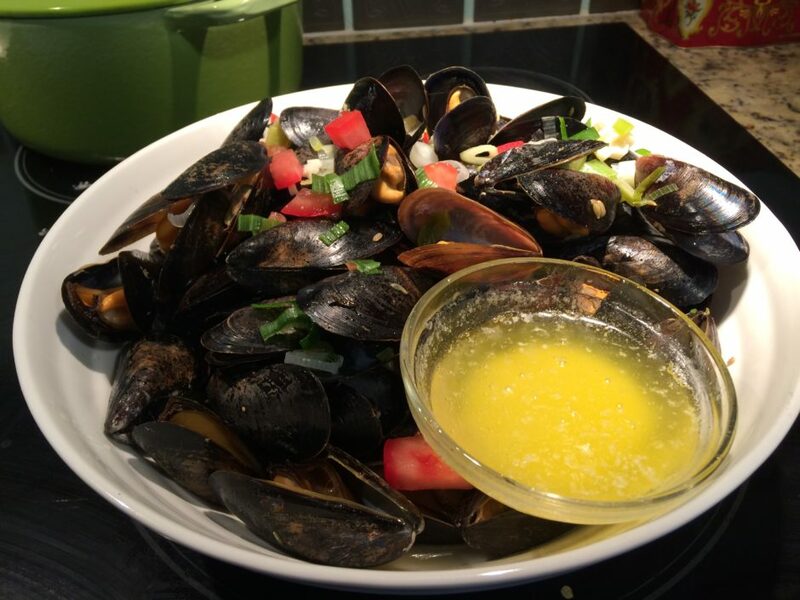 My favorite way to steam mussels is with white wine and a touch of Pernod. I was first introduced to steamed mussels by Tom Nye, a chef who cooked for a little restaurant in Greenwich called The Chowder House, where I waitressed as a teenager. It was located on Lewis Street, now long gone, it served only a handful of tables and Tom Nye made the most delicious chowders and shellfish I have ever tasted. Ever. Tom taught me that when mussels are harvested on the full moon, they are extra plump and he showed me so with each full moon catch. Somewhere, tucked away in storage, I have a tiny box full of teensy pink and gray mussel pearls I gathered from my many Tom Nye mussel meals. Tom steamed his mussels in the most delicious broth, good enough to eat with a spoon. He used only white wine, fresh rosemary, garlic and shallots. Over the years, I’ve added the Pernod flavor and the tomatoes, substituted a bit of fennel for the rosemary, borrowing here and there from the best of various restaurants where I have dined on mussels. Here is how I prepared my mussels in the photo. By the way, I ate all two pounds by myself. 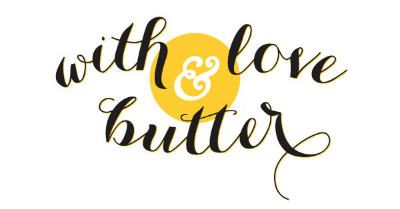 From me to you, with love and butter. 2 pounds fresh mussels, cleaned, Norwalk or Prince Edward Island mussels (or whatever your fish supplier has fresh).Toss out any that have begun to open. Ick…they’re dead. Do not use a sweet wine such as Zinfandel or Riesling. 3/4 Shot of Pernod, or Ricard, Anise or Ouzo. 1/8 Tsp ground fennel seed (Optional). Grind in a coffee grinder or a mortar & pestle. 2 Stalks green onion, chopped into small rounds. 2 Tablespoons of melted butter, in a separate dish, for dipping. 2 Cups of any dry white wine of your choice. 3/4 Ounce of Pernod, Ricard, Ouzo, or any Anise flavored liquor you have handy. When the wine has been brought to a simmer, dump all the mussels in and cover the pot tightly. Just before covering the pot, add the tomatoes and the sliced green onion. If you don’t have grape tomatoes, don’t worry. Just cut up a medium tomato into small bites. Allow the pot to steam for three – five minutes, checking after three or four. Your mussels should have gently opened. As soon you see nearly all are open, turn off the flame! You do not want to overcook them. Pour out the entire contents into two large bowls and place the lemon wedge (missing from my picture) and the melted butter within reach. IMPORTANT NOTE: If a now-cooked mussel refuses to open, toss it. You want to eat only the mussels that are open. Serve with your favorite dipping bread so you can soak up the broth. Use ONLY Wine, a Tablespoon of fresh rosemary, shallots, a pinch of salt, a little butter. We are attracted to food as much by color as by flavor.To my eye, red lentils have always looked so much more appealing than the typical, muddy-colored lentils I usually cook up with a big old ham hock. Their color lies something between creamy orange sickle and apricot. Plus, they have the added benefit of cooking up pretty quickly. The pretty soup took only 25 minutes to make … from beginning to end, yet it has a surprising medley of flavors going for it. It’s has a bit of heat, a touch of tang, and a few surprises. Plus, it is super quick and easy to prepare. Into a deep sauce pan or soup pot, dribble 2 tablespoons of good olive oil. 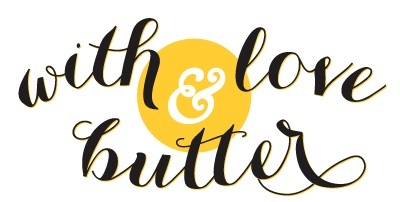 2 tbsp real butter or good butter substitute. I use Earth Balance in just about everything. 1 tsp rice vinegar or white vinegar (or lemon juice). Do not overdo the acid. 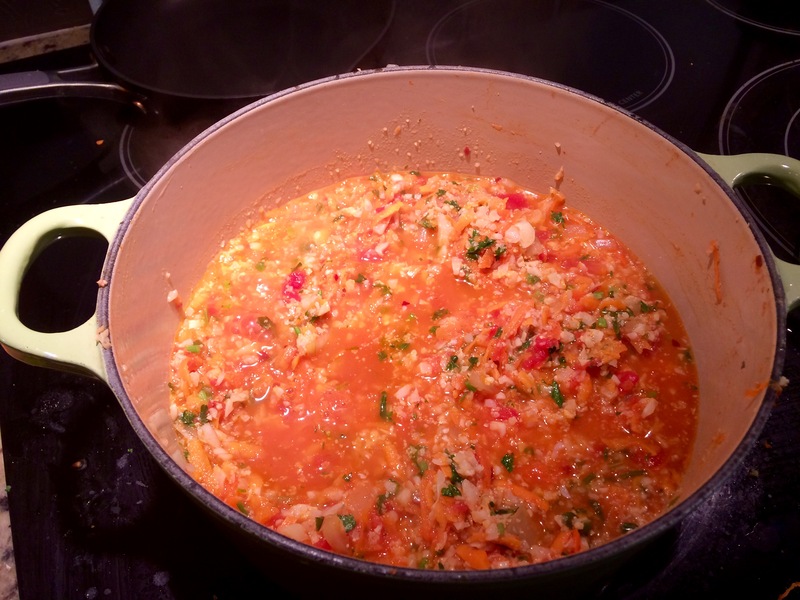 Allow this concoction to cook until the lentils are nearly soft, about 10- 15 minutes. Simmer until the lentils are soft, the carrots and potatoes soft to bite, but not mushy. TIPS: If you’re a meat-eater and want to make this into a heartier meal , add 8 ounces of breakfast sausage a few minutes after adding the lentils. Add by breaking the raw sausage up with your fingers or a wooden spatula in order to make small, bite sized bits. Serve with warm bread or croutons. Here you go people. It’s Grain-Free, Gluten-Free, Vegetarian & Vegan! Many years ago, I spent about 10 fascinating days in Istanbul where I was introduced to flavors profiles I had never tasted growing up in Greenwich, Connecticut. My very learned mother was keenly interested in just about everything and she did her best to bring the world to our kitchen table. Well, it was really a counter, probably one of the very first “kitchen islands” before they became popular. It was long, like a bar, and we kids bellied up every night at 6 pm, perched on stools, waiting to see what country was being served on any given night. She and our dad exposed us kids to an impressive variety of international foods. We were taken to Manhattan for Smorgasbords, but also never left the “city” without stopping at the now famous Papaya King for that then rare and exotic papaya smoothie. We tasted real Honduranian “Picadillo” with tender raisins. I watched, bug-eyed, my sister Madeleine cringing in complete horror, as our mother peeled and sliced up delicious beef tongue. I would sit on the counter by the stove, fascinated, as I watched my dad slice and fry up yummy these dark sausages he called “black puddin” which I later learned were also called blood pudding’. Enough said. But with all my parents’ interest in international fare, never had we been introduced to the flavors I discovered during the few weeks I spent in Turkey. One afternoon in Istanbul, I stopped to grab a regular meal at a cheap and local cafeteria style diner. I can’t remember all I put on my tray, but will never forget the surprise in my mouth as I tasted what I expected to be a plan, salty lentil soup. Wow! 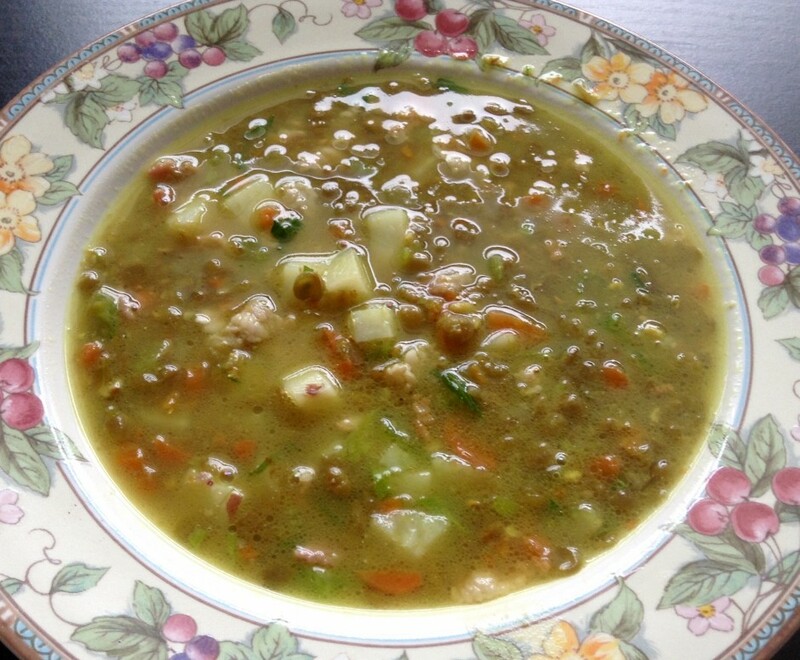 Turkish Lemon & Lentil soup bursting with unmistakable notes of mint, lemon and heat. Mint? In a soup? This was new to me. And lemon? Lemon in a soup with tomatoes? The experience, all those decades ago, was something entirely unexpected to this little New England girl. Today, as in the same morning of this posting, I wanted to try to recreate that never forgotten experience. Alas, I’m back on a the no-grain wagon with a renewed commitment. When you eat truly grain-free, lentils and other legumes are not on the menu! Well, only days ago, I had bagged up some cups of “riced” cauliflower so I thought I’d try using these in place of lentils. The result was a low-carb, vegetarian & vegan (without the dollop of sour cream) hot, spicy, minty and lemony medley. I enjoyed my first taste of this soup in a nice bowl, but I think tonight I will place a poached egg on top for protein. 2 tbsp fresh, chopped mint leaves OR dried mint. 2. Cover and allow to simmer on low for 10 minutes, adding salt or lemon or mint to taste. 4. Once your vegetables are soft and the flavors have emerged, pull out your hand-blender (or a regular blender) – do not puree – and lightly mix up all the mixture until you still have visible vegetables, but not slush. 6 Ladle into a nice bowl. 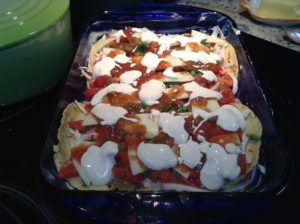 Garnish with parsley or mint and a nice dollop of sour cream, or sour cream substitute. 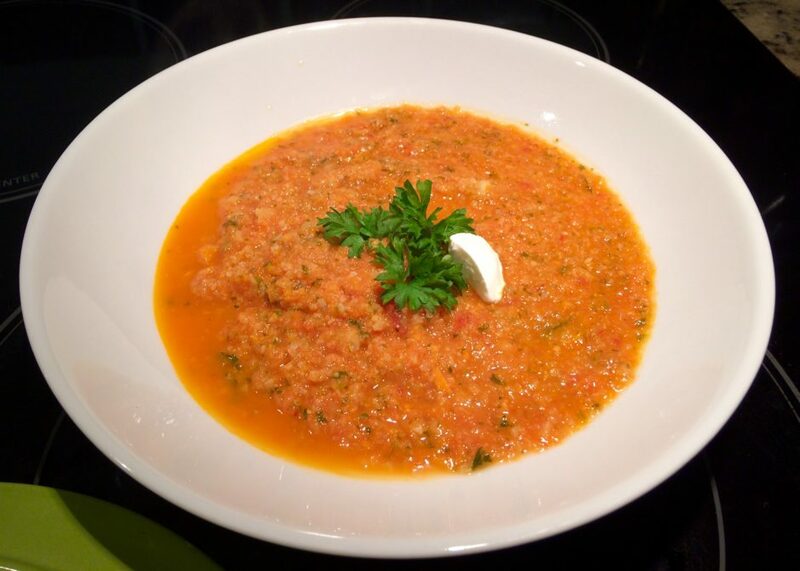 You can make this same recipe SUBSTITUTING RED LENTILS and OMITTING the Cauliflower. 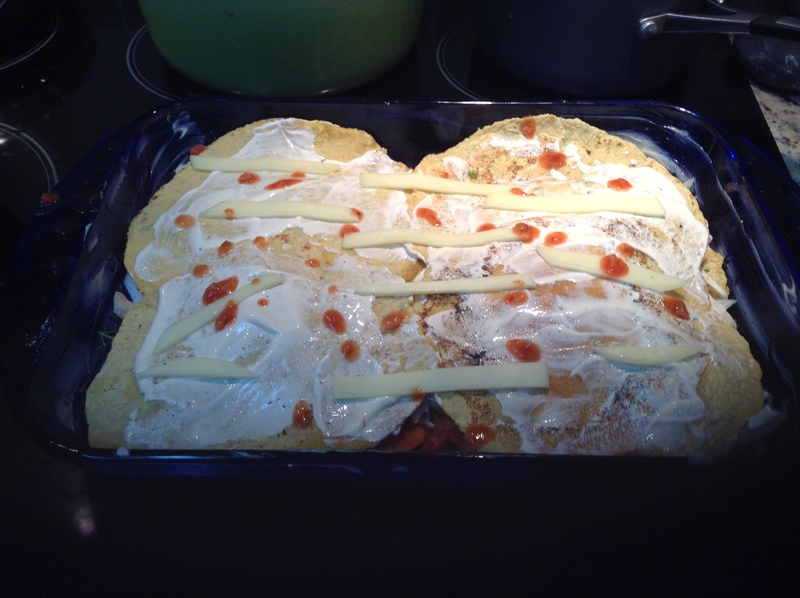 If you do this, do NOT add the sour cream. If you are serving this as an appetizer, cut up some oldish bread, sautée quickly in salted olive oil until crispy and golden, and serve on top! I enjoy a nicely poached egg on top of spicy vegetables and the lemon will be fine. Remember, Hollandaise sauce is very lemony! When I really want to make this a warm, late night comfort meal, I melt a slice of mild and creamy cheese on top of the egg. That is not for vegans though. 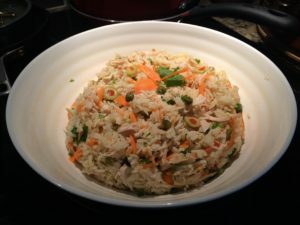 Arroz con Pollo is a staple of many Latin American households and there are as many ways to prepare it as there are moms and grandmothers. I make it the way I was taught by my neighbor in the Panama Interior, with a few spins of my own. What’s even better is Arroz con Pollo is versatile; serve it hot or cold, and it’s easy to put your own spin on it using whatever feels right to you, or what makes sense from your fridge on any given day. Leave out the chicken and bingo! Now you have a Vegetarian/Vegan dish! My recipe is perfect for both left-over chicken and left-over rice. I don’t always make it with left-overs. I’ve been known to gently poach chicken breasts and then hand-shred them. But that’s just not necessary. And if you are using freshly cooked rice, chill it before blending it into the dish. This past Saturday was “beach out like a whale” day which in my house. means lots of binge TV and binge food, including super market fried chicken. On Sunday, I was left with an ample amount of tender chicken under the cold, crusty, greasy skins. I also had a decend amount of cold, left-over chinese take-out rice (let’s not discuss that binge!) — perfect since this recipe uses cold rice. 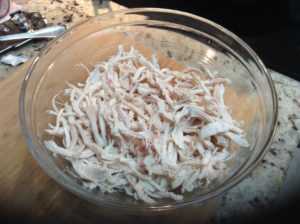 I peeled and tossed the chicken skins, shredded the tender meat, and set it aside. Place two cups of cold, cooked, white rice into a large bowl. If you have freshly cooked rice, spread it out in a wide dish and refrigerate 1/2 hour. 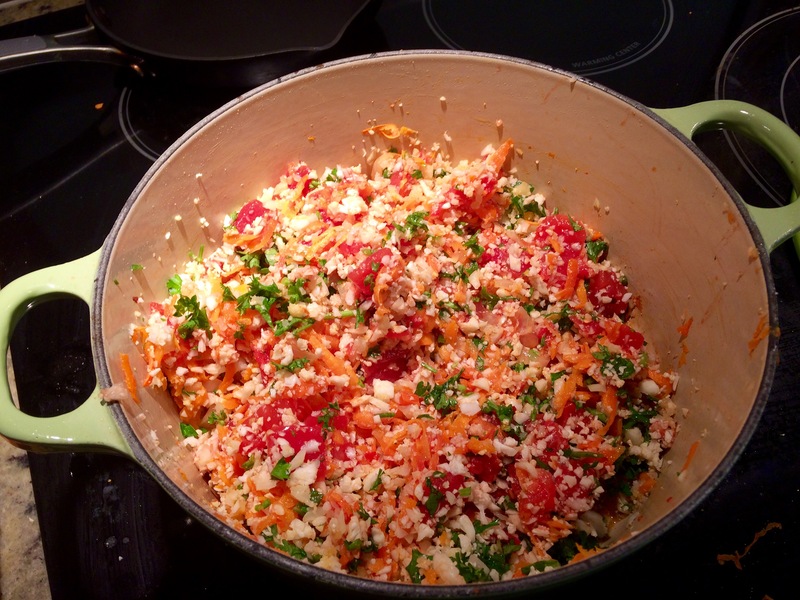 To the rice, add the following, adjusting quantities according to taste. As a main course, I was taught to serve this warm and always together with a light, crispy and simple salad with Russian dressing. Personally, I love the warm rice dish together with the crisp cold of the salad. 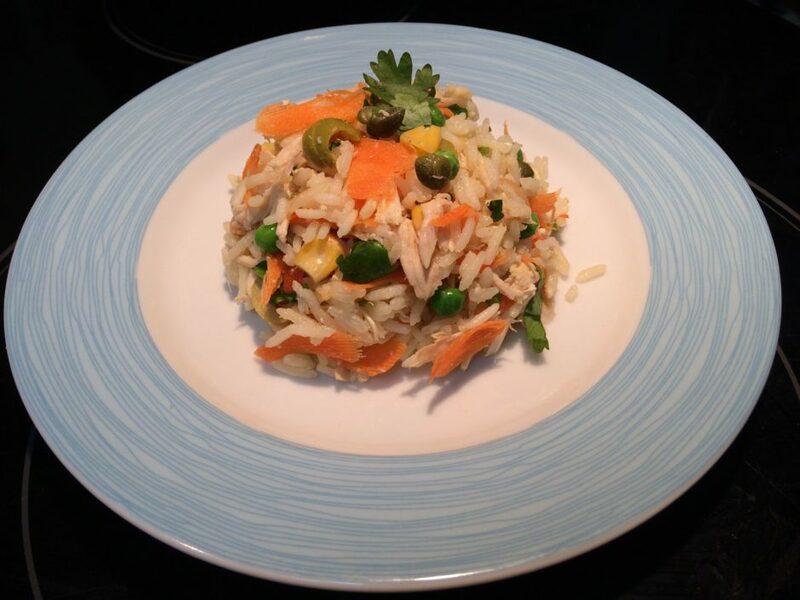 TIPS: This is such a versatile and deceptively filling way to eat rice and chicken so change it any way that works. 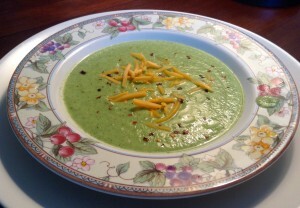 Add chopped celery tops (the light green only) or celery heart. Make it without the chicken and you have a Vegetarian/Vegan dish. Remember: Use cold rice. 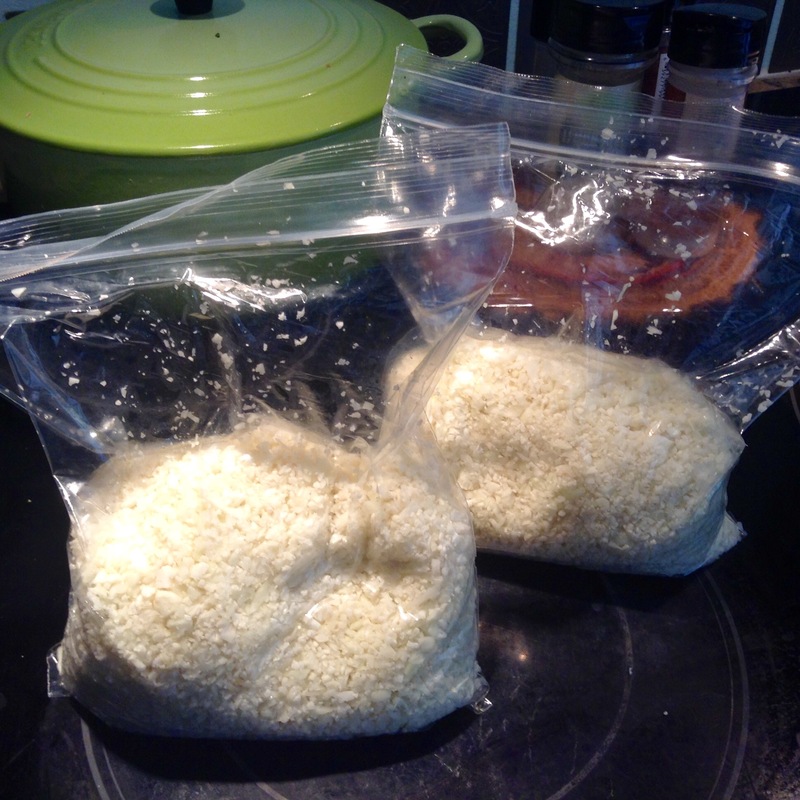 It’s easy to quickly chill freshly made rice. 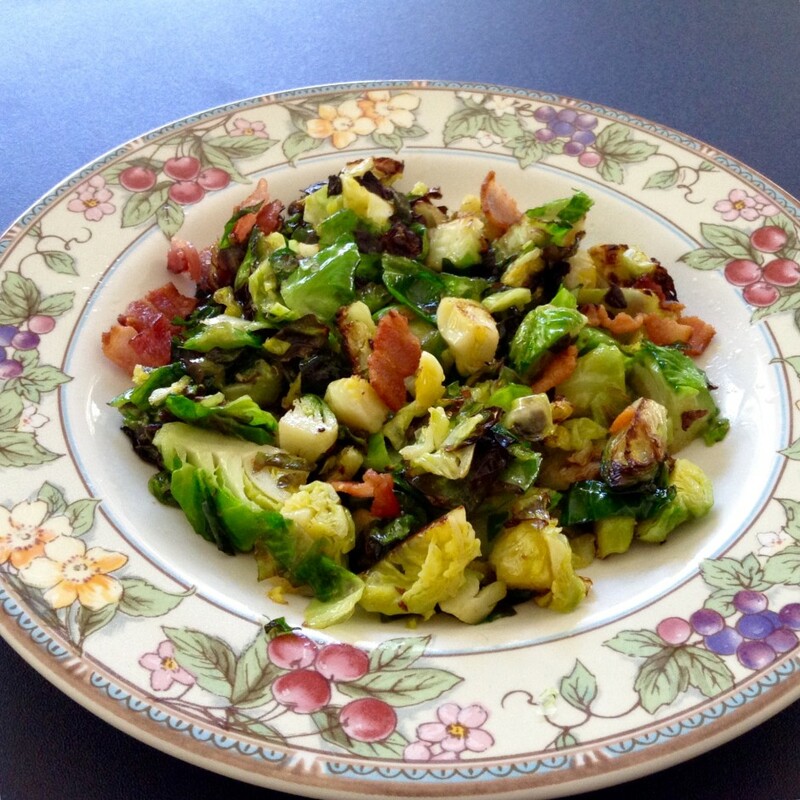 Serve hot or cold, as a side dish or as a main course. With all the healthy food I post here on With Love and Butter, you might be shocked,okay, even disgusted, to discover that I have some truly appalling choices when it comes to what I consider “comfort food.” But hey, it’s personal, isn’t it? Doesn’t everyone have a closet comfort food they’d rather not admit to the world? Some sinful, completely non-gourmet slop you eat when you have the house to yourself, curtains drawn, shutters closed, snuggled up in front of the TV? So here is my confession, the greasy, salty, truth. My go-to favorites usually come from 1. a can and 2. they’re loaded with sodium, usually 800 or 900 mgs., enough send the needle on my scale soaring at least 4 extra pounds the next morning, and zoom my blood pressure into the stroke zone. Give me tamales (I’m not even a little discerning; they can come from the Dollar store! ), or mushy, sugary kid-friendly Ravioli, also a frequent dollar find. I’m good for the whole can. Also, I’m not above devouring a couple of eggs poached atop a greasy plate of canned corned beef hash, extra crispy on the bottom, occasionally topped with a slice of melting, cheese (um, more salt!). But my all-time favorite, sinful, salty satisfier is Campbell’s Cream of Mushroom Soup, usually made with Half & Half, and dotted with gooey, melty bits of cheese. There’s just something about that combination that takes me to an emotional comfort zone rarely found anywhere else but the occasional bowl of warm Mac ‘n Cheese. Sure, I can cut down on the salt by choosing the so-called healthier version, but check the label. There’s still a load of sodium in there plus, I usually end up adding more. Finally, speed is a factor. When you are in need of an emotional food high, comfort food is something you need now. No waiting. So I came up with an admittedly still slightly sinfu– l but much healthier — home version and it took only 10 minutes. That’s no lie. 1 Teaspoon of finely chopped, fresh Tarragon. 1 cup finely chopped, white mushrooms. Once your mixture is bubbling away, grab a tablespoon of Gluten-Free Flour (or regular, white flour if you use that but I find the Gluten-Free flours tend to incorporate easily, without needing to make a roux. Also, I use my fingers to sprinkle it gently over my mixture, like a fine snow. Then quickly whisk it in to avoid clumping. If your soup seems to loose and you want it thicker, just sprinkle in more, a half teaspoon at a time. Voila! You’re all done! 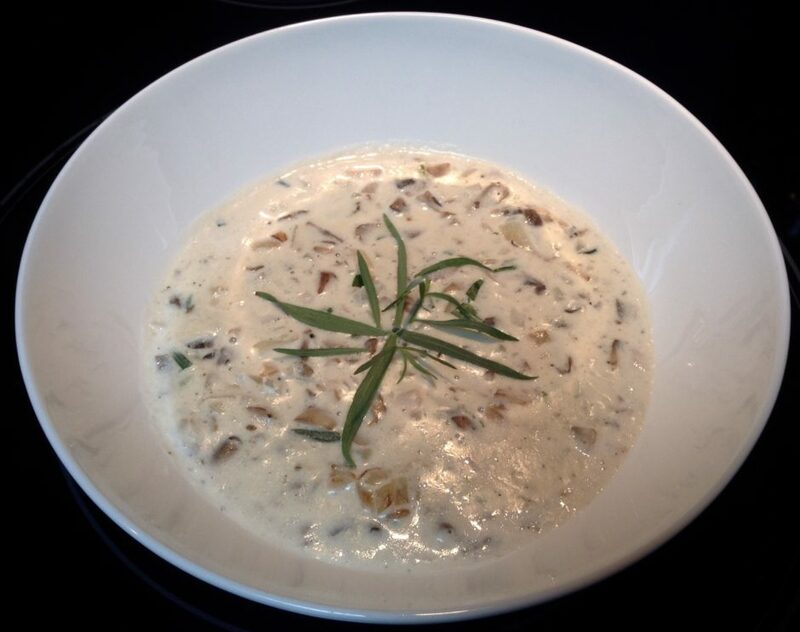 Now you have a rich and creamy, home-made mushroom soup with very little salt, the benefits of fresh mushrooms, onions and herbs, fit for company! DON’T FORGET: You may substitute Fresh Thyme for Tarragon, and if you don’t have fresh herbs, just use dried. Long before I can remember ever seeing a commercial tortilla with any pizazz, I began jazzing up my own totillas with fresh herbs. My favorite herb to use is Rosemary, freshly cut and finely chopped. When you add just a bit of fresh herbs and salt to your tortilla mix, the notes come through just enough to make the lovely, subtle difference you need to transform a bland tortilla base into an integral part of the dish. Rosemary seems to go well with most dishes where I use tortillas, such as the Mexican inspired lasagna below, with eggs dishes, or even home made tortilla chips. How to make Elizabeth’s Mexican-Inspired Poached Chicken Lasagna. Place two, plump, boneless chicken breasts into a pan with about 1-1/2 inches of water. You to not have to submerge the chicken. Simmer (do not allow to boil) for about 5 – minutes. Turn OFF the heat and allow chicken to rest for a full 20 minutes, cover still on. 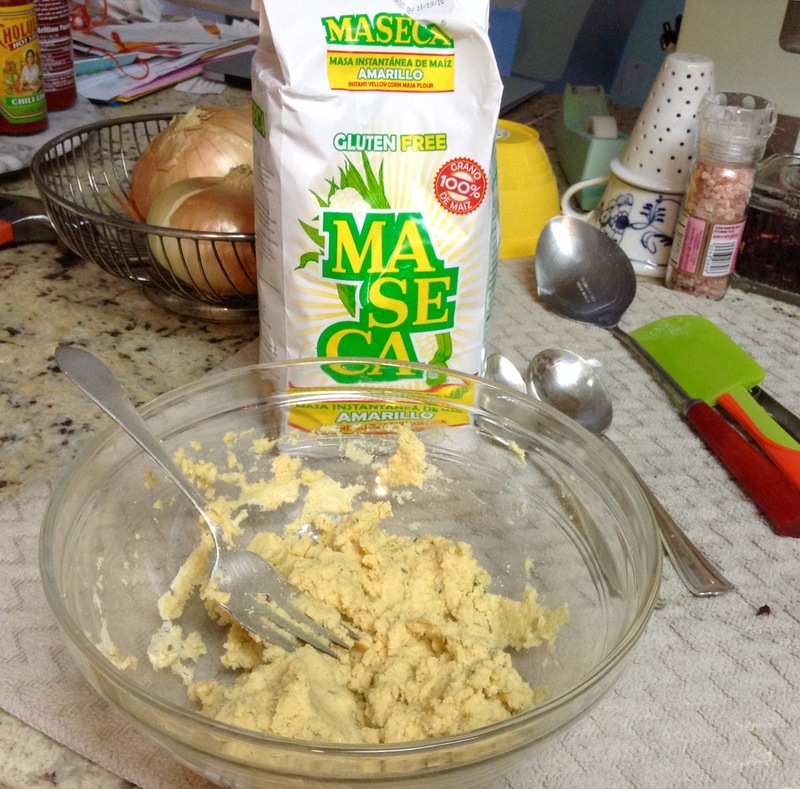 Most supermarkets carry Maseca, a corn flour mix which blends fast & easy with water. I use about equal parts of flour to water. I prefer the white Maseca which I found in Panama. Here in the USA I found only yellow so I went with that. No big deal. First: I measured out a large, heaping spoonful of dry dough for each tortilla. For this recipe I wanted 12 tortillas. I think I probably used 16 spoonfulls for 12. Next: I added about a 2 tablespoons of finely chopped Rosemary to the dry flour … and some salt. Then: I began adding water, stirring with a fork, a spoon, or my clean fingers until I achieved a moist mass of dough that easily molds into golf ball sized nuggets. Note: This is hardly an exact science. Maseca is forgiving, so if your mix is too wet, sprinkle on more flour, or if it’s too dry, add a spritz of water. 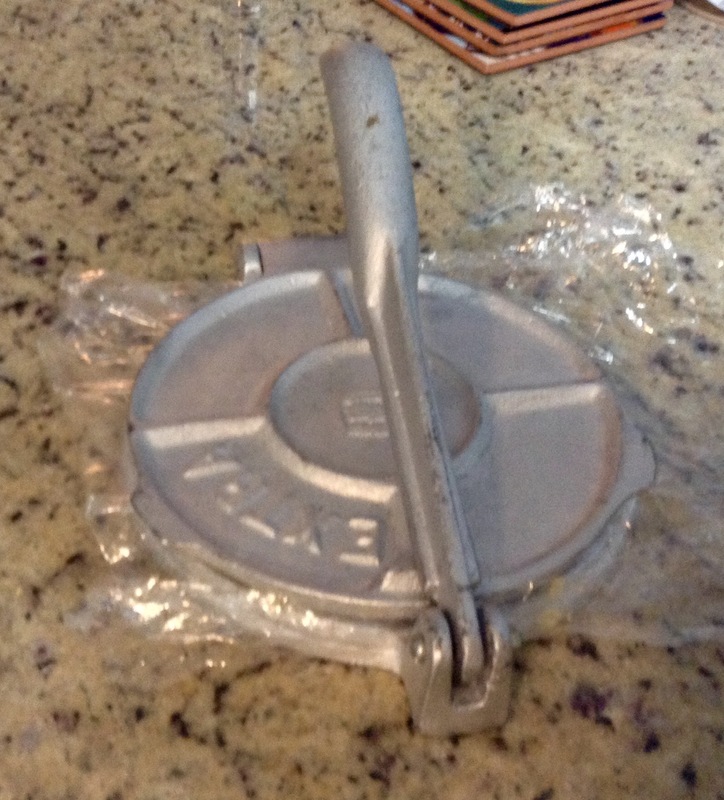 Tortilla Press I searched for months — online and in stores — for a simple tortilla press, coming up empty-handed. 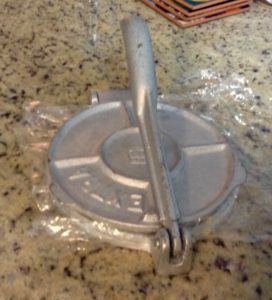 Then my little sister, Chiclet found not one, but two heavy aluminum presses, both at the GoodWill — both costing a whopping $5! It’s easy breezy to press a tortilla! 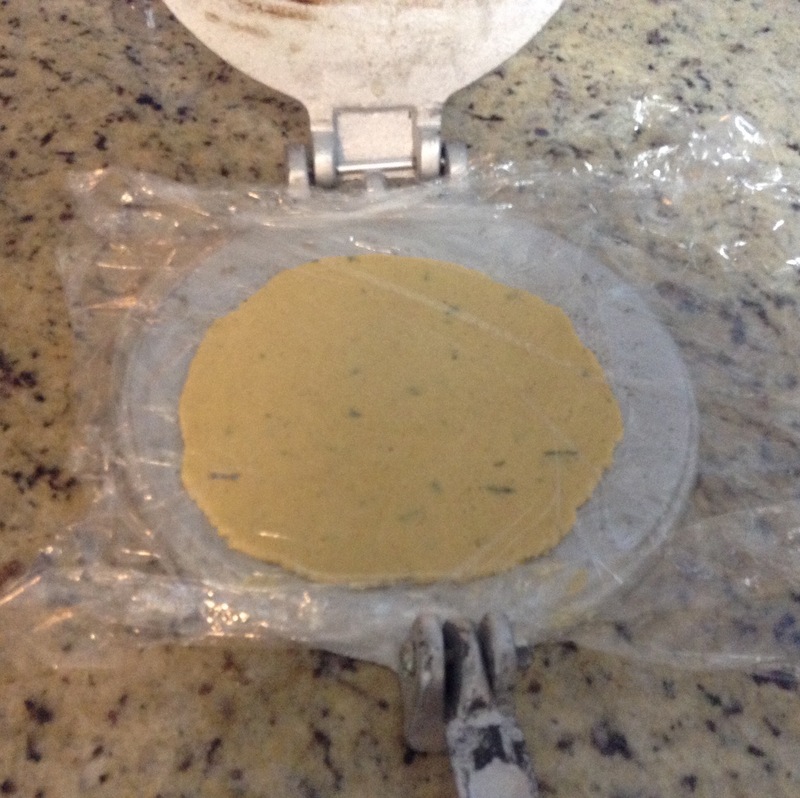 Lay the right half of a long piece of plastic wrap over the press. Place your ball of dough in the center. 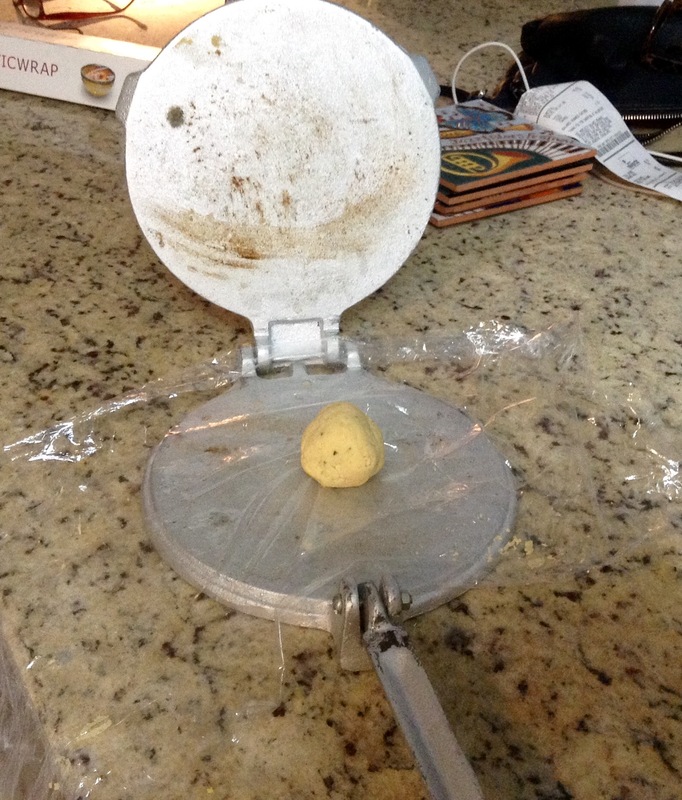 Fold the upper half of the plastic wrap over the top, press and… Presto! Peel the plastic wrap slowly and flop your tortilla into a hot skillet. No oil necessary! 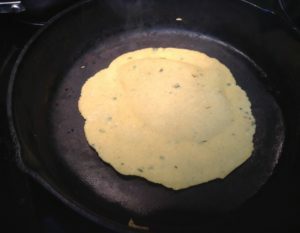 The tortilla will likely bubble up and that’s when you flip it, just one time. If it doesn’t form a bubble, flip it after about a minute. 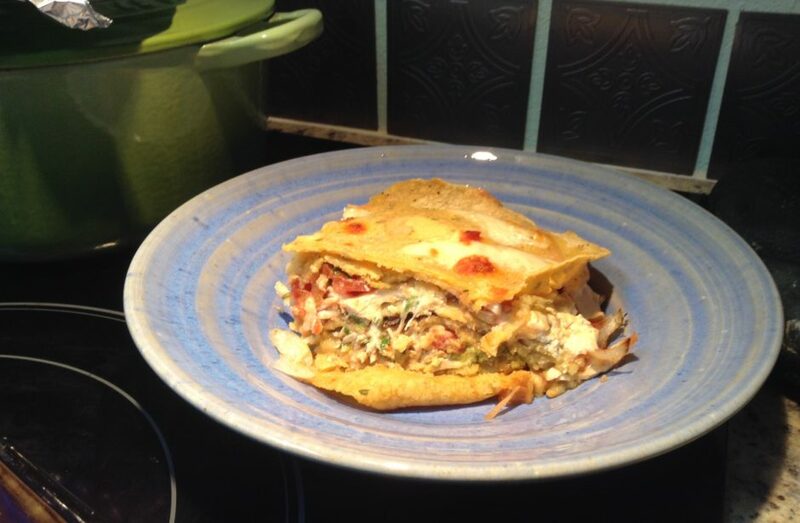 Cook the tortilla another minute and set it aside on a plate. Repeat until you have 12 stacked up. It does not matter if they are softer or crispier. They are going to bake in the oven anyway. As I said, this is not an exact process and it is forgiving. Proper cooks shred their now cooked and cooled chicken breasts with a fork. I confess, I pull apart my chicken threads with clean fingers. I’m hyper and I have no patience. Butter the bottom of your favorite baking or lasagna dish. Lay down four tortillas and cover with half the shredded chicken. Over the chicken, layer on thinly sliced, sweet, white onion. Now add fesh, chopped cilantro, about 1/4 cup. 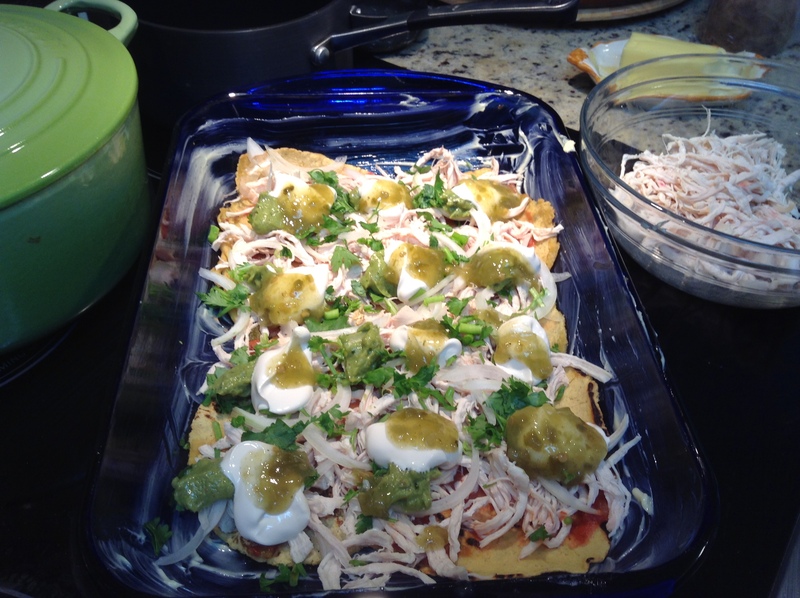 Place evenly dots of guacamole (optional) and then cream or sour cream. I mixed up a combination of sour cream and Nestle canned cream, added salt, and dotted my dish with this. Now add dots of Salsa Verde or Rotel salsa. Over all this, lay on some Provolone cheese. I prefer provolone because it is less gooey, but you can feel free to use mozzerella or any melty cheese of your choice, such as Monterrey Jack, etc. It doesn’t matter. Cover this with four more tortillas and repeat the above process. Cauliflower is very popular these days as a healthy replacement for not only carb-loaded potatoes, but as a meat replacement in dishes such as Tacos! If you’re eating Paleo, Vegetarian. Grain-Free, or just wanting a new way to get your veggies, this super simple preparation is for you! Split or quarter 1/2 of a large head of Caulifower, leaves included, except for those really thick, tough leaves that don’t steam up well. Have 1/4 cup loosely chopped onion handy but don’t add yet. Cover your Cauliflower with salted water (2 tsp salt) and simmer until easily stabbed with a fork. About 3 minutes before it is really soft, toss in the onion! When fork-soft, drain and place in a large bowl. While still hot, chop or break the cauliflower it into smaller pieces with a scissors or a knife. This should be easy. Puree all the Cauliflower & Onion with a hand blender, or whatever blender/food processor you use. Leave a few lumps for a nice consistency. Once pureed,sprinkle in about 1/4 cup of Italian blend cheese or a very mild cheddar, or any mild cheese. Now stir in the cheese until combined and melty. Spoon your puree out and garnish with fresh herbs. 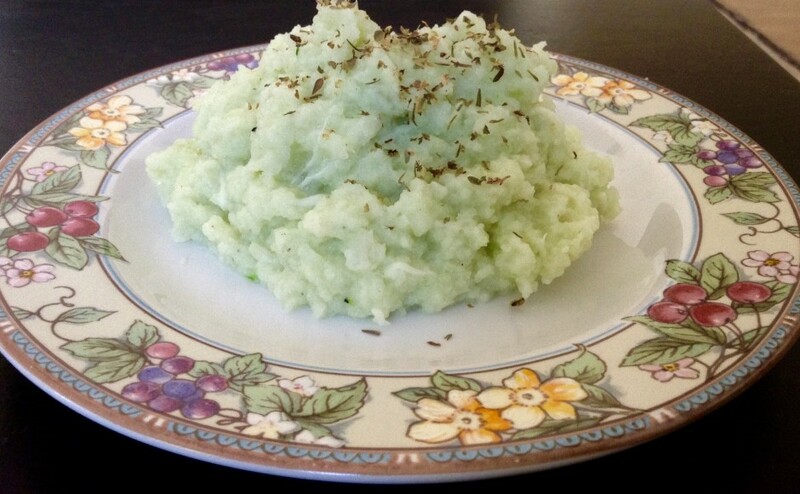 TIPS: To treat this more like traditional mashed potatoes, add a little Half & Half to the mix as you puree. You can also top with gravy or, on each serving, top with a dollop of Sour Cream, Chives, and extra Cheddar. Cauliflower is influenced by the flavors that surround it. Let’s face it. Most things really are better with bacon. The key to getting a lot of flavor into this soup is the bacon, and also using either a good, home made stock, a high-quality store bought stock, or a combination of the two. No hard, dried little flavor cubes! 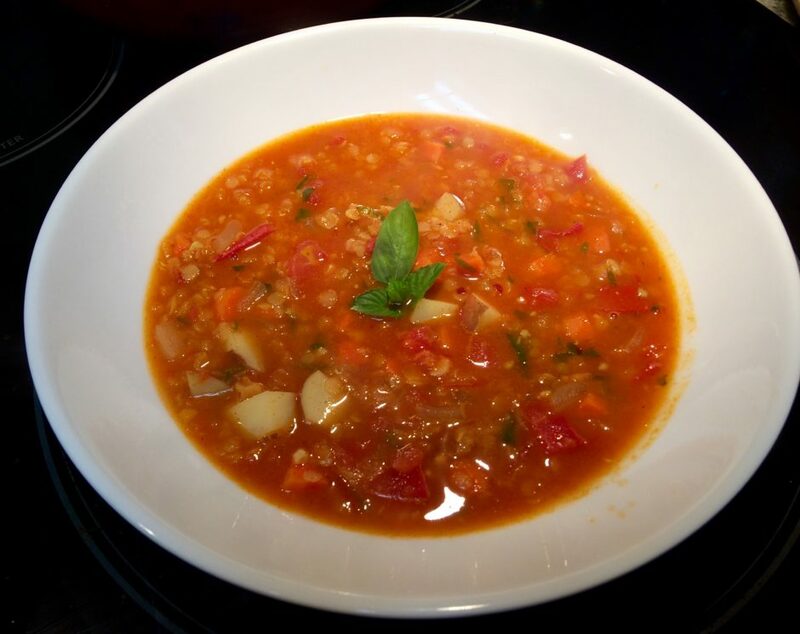 Here is how I make my truly mouth-watering, Lentil Soup. Boil 1 cup of dried, quick cooking lentils in about twic 2-1/2 times as much liquid. Add 2 small cloves garlic, minced. 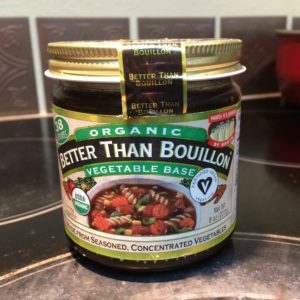 For liquid/broth, I use a combination of good quality beef stock and my own, delicious, super healthy bone broth, if I have some. My lentils take about 20-25 minutes to really soften up so you ca get these bubbling away on the stove top while you prepare the remaining ingredients. Peel and dice a medium potato (I used red but removed the peel). You can set these to boil about 15 minutes OR you can toss them in to boil with the lentils for the last 15 minutes of lentil cooking. Peeled and diced potatoes will not require that much time to soften and you don’t want them too mushy. In a frying pan, sauté 6 strips of bacon, cut up (I use scissors leaving all the fat right in the pan as the bacon sizzles away. By now, your bacon is nearly done so toss the carrot, celery and onion into the bacon pan and cook for about 5 minutes. When the lentils are soft and the potatoes are cooked (i.e., easily stabbed with a fork), add the bacon and vegetable mixture and every drop of bacon fat. Salt and pepper to taste. TIPS: For a heartier meal, add chunks of sauteed ham or bratwurst. You can also add some of the tender celery leaves, chopped, for additional flavor. The better your broth, the more flavorful your soup will be. I recommend reading up on the health benefits of your grandma’s good, old fashioned bone broth. 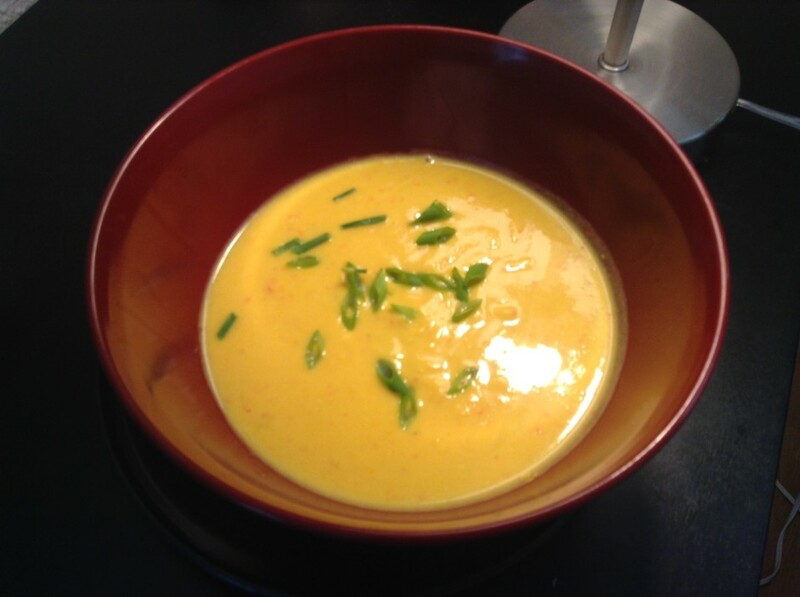 Real bone stock imakes a pivotal difference not only on how flavorful your soup will be, but how healthy! I find Caulifower takes on any flavors you add, so it pays to be bold, not shy, when it comes to this gorgeous, healthy vegetable flower. I just made this up, so add or change any items you wish. Break up a medium to large head of Cauliflower. Place all the pieces in 1 inch of water, in a large sauce or soup pan. You do Not need to cover the vegetables! Just an inch for steaming or your soup will be too watery. Toss – right on top — 3 whole spring onion stems, cut in half, the green part and all. Add 2 tablespooons of chopped, sweet red peppers. Shake in some of your favorite salt to taste.Not too much as you or your guests can add this later. Cover all the above and steam first on high, then medium, until all the ingredients are easily broken up with a fork… About 10 minutes. Blend throughly with a hand mixer right in the pot. This will remove some of the heat. If you don’t have a hand blender, use A regular blender…but do this in small batches to avoid explosion as the heat expands in a closed environment. Once blended but still quite warm, add 1/2 cup of Half & Half. Now, add also about 3/4 cup of shredded Cheddar (or any preferred cheese) and stir or blend lightly. You can cream the cheese at this point, or leave visible bits. For color and taste, NOW add 1 tsp. ground Turmeric. If you have fresh, wonderful. (See below for suggested substitutions). Blend all the above together. If you are Vegan, use Coconut milk and a cheese substitute. Don’t have or care for turmeric (which contains serious anti-inflamation properties), try curry powder, or a little fresh or powdered ginger instead. Try roasted peppers or jarred pimento instead of the fresh, sweet red pepper. Try steaming your vegetables in chicken stock. Use another vegetable, such as broccoli. Don’t tell the kids about the cauliflower! Just say it’s a creamy, cheddar soup! Everything is better with bacon. And teensy cabbages are no exception. 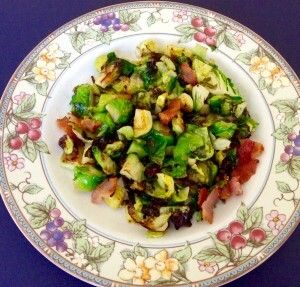 Oh, you think you don’t care for brusel sprouts…but ah, you haven’t tried this dish. I dare you to serve this up to even the most reluctant eater, and I encourage you to cheat; Don’t even tell them what it is. You’ll see. With your favorite scissors, dice up 4 slices of bacon and stir fry until crispy. Set aside and drain, leaving about 3 tablespoons of the bacon greese in the ot pan. Cut about 8 fresh brussel sprouts in half. Then quarter them. Toss these into the pan along with the hot bacon grease and stir fry until the edges feel crispy and begin to brown.